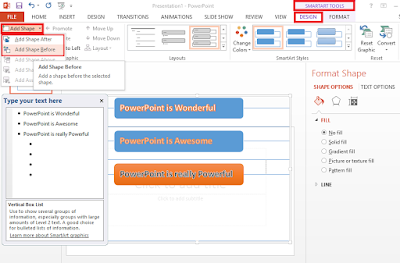 This is the second part of this PowerPoint tutorial.It is a step by step tutorial that explicitly explains how to manipulate the SmartArt elements and Master Slide features of PowerPoint. The SmartArt tool helps you to create high quality diagrams and symbols. You can use this tool to convert bulleted lists into a diagram and symbols. 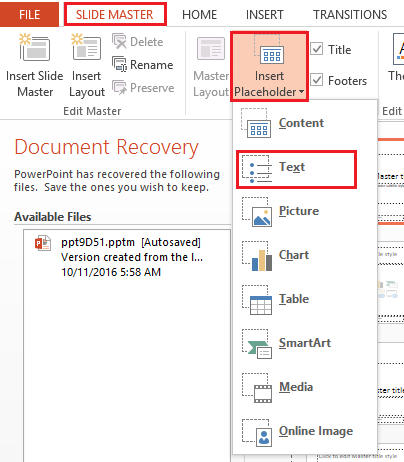 This feature was first introduced in PowerPoint 2007. This tool has many categories of diagrams and symbols like: All, list, Process, Cycle, Hierarchy, Relationship, Matrix, Pyramid, Picture. The figure below shows the different categories of graphics with their descriptions. 1. Select the slide you wish to add SmartArt graphics. 2. 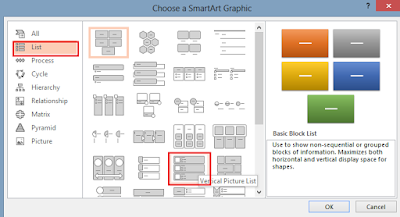 Click the Insert tab and click the SmartArt button located in the Illustrations group. This prompts the Choose a SmartArt Graphic dialogue box to appear. 3. 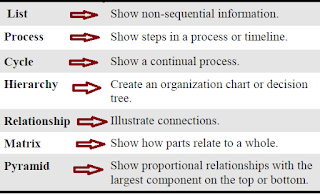 Select a chart or diagram type from the list, and then select a chart or diagram sub-type. 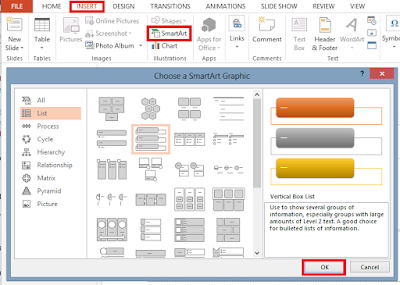 Click OK. PowerPoint inserts the SmartArt object into the slide as shown in the figure below. Now that you have succeeded in inserting the SmartArt objects into a slide, the next step is to add texts into the text place holders. You can use the text pane or type directly into the placeholder when adding texts to a SmartArt graphic. 1. Click any or each of the [Text] placeholders where you want to add your text and then start to type as shown below. 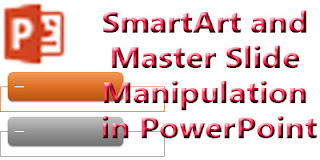 It is very crucial that you understand how to manipulate and work with SmartArt elements because it will help you to create an effective and attractive SmartArt graphic. Am going to show you some necessary techniques like adding new shapes, replacing shapes with different ones and removing those you don’t need. I will also show you the most interesting which converting slide texts to SmartArt Objects. Most times when working with SmartArt, you may need to add an extra shape to the smart objecting you are working on. 1. Select the SmartArt graphic you wish to add the shape. 2. Select the shape before or after which you want the new shape to be. 3. 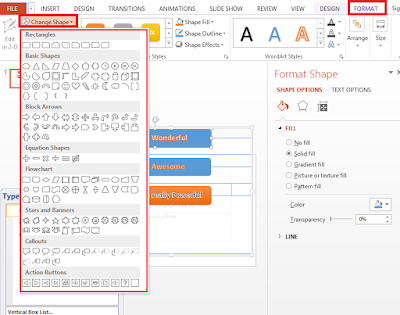 Click the Design tab under SmartArt Tools, located at the topmost middle of the application window and then click the dropdown arrow under Add Shape in the Create Graphic group as shown below and then select Add Shape before or Add Shape after depending on your need. PowerPoint inserts the new shape your specified location. As it is possible to add shapes, we can also replace existing SmartArt Shapes with new ones. It is very easy to achieve. 1. Select the SmartArt graphic containing the shape you wish to replace and then select the shape that you want to replace. 2. 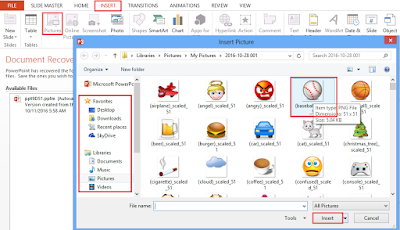 Click the Format tab located under SmartArt Tools and then click the Change Shape button in the Shapes group. The Shapes Gallery appears as shown below. 3. Select any shape of your choice from the shape gallery. 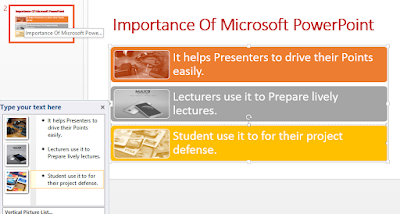 PowerPoint replaced the existing shape with the new one. Like I said earlier, information represented graphically drives more points than those represented using bulleted texts. 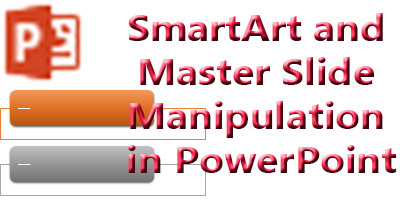 In PowerPoint 2007 and later versions, you can convert these bulleted texts to SmartArt object easily. 1. Select the placeholder that contains the text you want to convert as shown below. 2. Click the Convert to SmartArt button in the Paragraph group under the Home tab. The SmartArt gallery appears with some layouts that work best suits bullet lists. 3. Select a layout from the gallery or click on More SmartArt graphics to see all layouts and then select any of your choice. 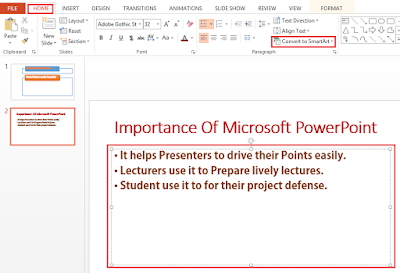 PowerPoint transforms the selected text into a SmartArt graphic as shown below. If you wish to apply the layout I used in this illustration, it is located under lists as shown below. I added those thumbnail pictures by clicking the picture frame in the Type your name here pane shown in the figure above and then I selected Work Offline from the dialogue box that popped up. Finally, I now browsed for the picture in my hard drive. 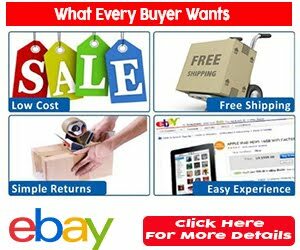 You can browse for pictures online if your computer us connected to the internet. 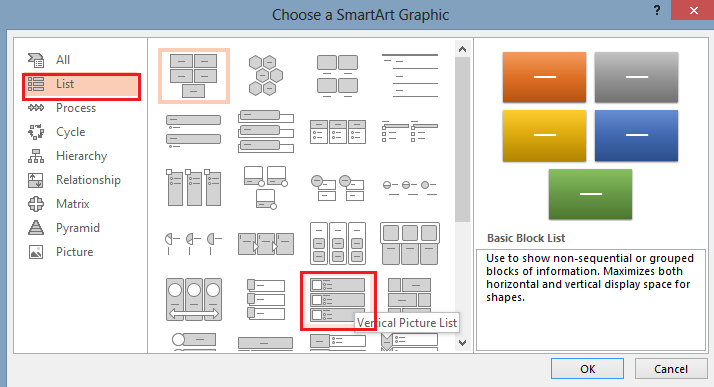 Play around the Design and Format tab located under SmartArt Tools tab if you wish to discover and learn more about SmartArt. It is the beauty of PowerPoint presentation slides. There is more Smart art tool than what I just showed you. In fact my aim is to entice you so that you can learn more on your own. It is important that you understand the difference between Master Slide View and Normal Slide View. The master slide is a PowerPoint template and it used to design the layout of slides before you start to add content to individual slides. It can also be used to specify colours, fonts, headings, images and object positions. Once added to the master slide, these specifications will automatically be applied to all other slides in the presentation. This saves a lot of work and time. 2. Click Slide Master. 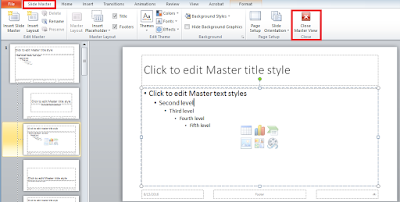 PowerPoint displays the Master Slide view. The first option in the list preferable most times. 1. Click Close Master View under Slide Master tab in the Close group as shown below. 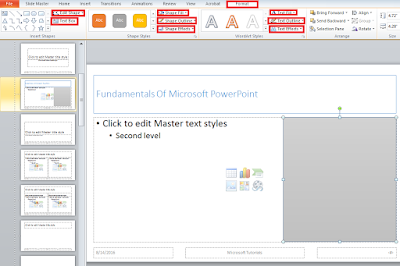 PowerPoint displays the Master Slide view. The first option in the list preferable most times. A presentation with slide numbers and dates is more professional and sometimes exam questions may require you to add page numbers and dates to the master slide. You can achieve this in master slide. 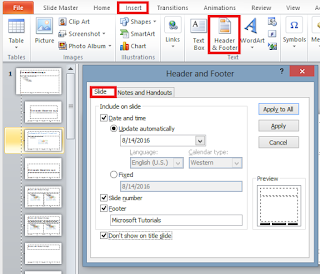 This procedure also shows you how to add a header and footer on your master slide. 1. Open Master Slide View. Click the Insert tab and then click Header and Footer under the Text group. 2. PowerPoint opens the Header & Footer window. • Check the Date and Time box. • Select the sub-option Update Automatically under Date and Time. • Check the Slide Number box. • Check the Footer box and then type the footer note inside the text box under the footer check box. You may also check the last check box Don’t show on title slide if you don’t want the header and footer to appear on the slide containing the title. • Click Apply as shown below. 3. Close Master Slide View and you will notice that the Date/Time and Page Number has been added to the bottom of each slide. Adding any shape of your choice to your master slide is most times used as an alternative for the header and footer. You can easily add any shape of your choice by simply selecting the shape. Remember that any shape you add to the master slide will automatically appear in all your presentation slide, thereby saving you time and energy. 1. Open Master Slide. 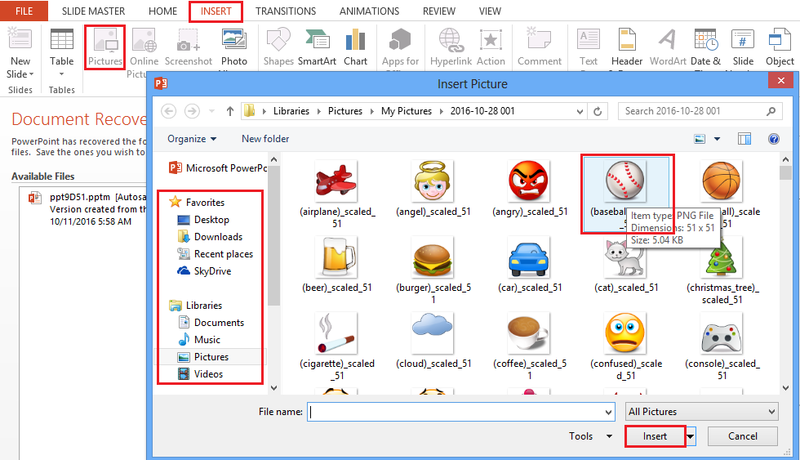 Click the Insert tab and then click Shapes under the Illustrations group. 2. Select any shape of your choice and then click and drag on the Master Slide draw it. 1. Click the shape and click the Format tab. 2. Click Shape Fill and then select any colour of your choice. 2. Click Shape Outline under the Shape Styles group and then select No Outline. 3. The shape is set above other items on the slide. To send it behind other items, right click the shape and click Send to Back. 4. Close Master Slide View and you will notice that the shape has been applied to all slides as shown below. There are more things to learn under the Format tab. Check the features under Shape Effects, Text Fill, Text Outline, Text Effect and Edit Shape drop down menus yourself as indicated in the image above. Just play around the Format tab. It is full of fun! 1. Open Master Slide View through the View tab. 2. Click Background Style under the Background group of the Slide Master tab. 3. Click Format Background as shown below. 4. Then the Format Background dialogue box appears at the extreme right of the window. Choose Solid Fill and select any colour of your choice and then Click Close as shown below. You can also choose Gradient fill, Picture or texture fill or Pattern fill depending on your choice. 1. Open Master Slide View. 3. Click the Insert Place holder drop down arrow located in the Master Layout group and then select Text from the drop down menu as shown below. 4. Click and drag to draw the Text Box in the correct position. 5. Highlight and delete all the default bullet points and text and type in the text that you want to display as shown below. Most times, you may want to add a picture or a logo that appears on every slide of the PowerPoint. The best way to do this is on the Master Slide. 3. Click the Picture icon located in the Images tab. The Insert Picture dialogue box appears as shown below. 4. Open the location of the image in your hard drive and select the image or logo and then click Insert as shown above. 5. Position the image into the correct place and resize if necessary. 6. Then close the Master slide view. 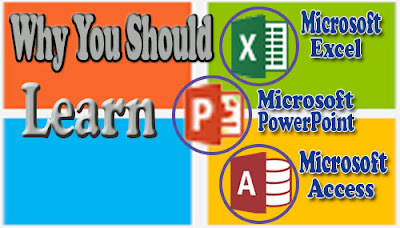 PowerPoint inserts the image in all individual slides. This is the end of the Part 2 of this PowerPoint tutorial. 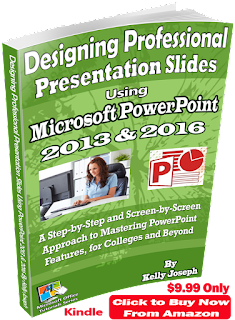 INTERACTING WITH MULTIMEDIA, OTHER PROGRAMS AND PRESENTATION FINAL TOUCHES IN POWERPOINT 2016.